It may be cold outside, but that doesn’t mean we should hide away inside. In fact, winter is an awesome time to get outside and rediscover nature. Obviously, you wouldn’t want to go outside when it’s -25°C or blizzard conditions. When it’s sunny and the temperatures are more reasonable, it feels invigorating to take a deep breath of cold, clean air. There are many memories to be made in the winter months! When I think back to my own childhood, I fondly remember how much fun we had on our family snowmobiling excursions. We lived beside a huge field and bush. The whole family would hit the trails and spend hours outside. My dad used to pull a sled behind his snowmobile and I remember cuddling up with my sister and singing Whitney Houston songs as we blazed up and down the trails. I wish we still owned snowmobiles because I’d love to be able to take my own girls out on those same trails. However, we are enjoying winter in other ways and it’s still just as fun. For starters, we live about a three minute drive from the biggest hill in town where everyone goes for sledding. 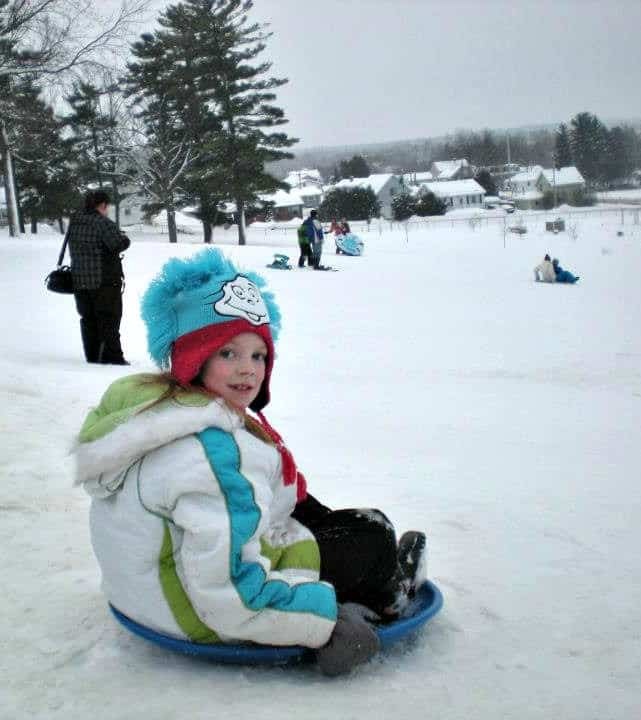 Mother Hill, as its called, is the perfect spot for riding the slopes on your toboggan. We love going there as a family. They love the speed they can get going down the hill. It kind of scares me a little. I’m not as brave as I once was! It’s fun to see the joy and squeals of delight on my daughters’ faces! The only thing they don’t like is the long walk up the hill. Let’s just say that it’s a workout! 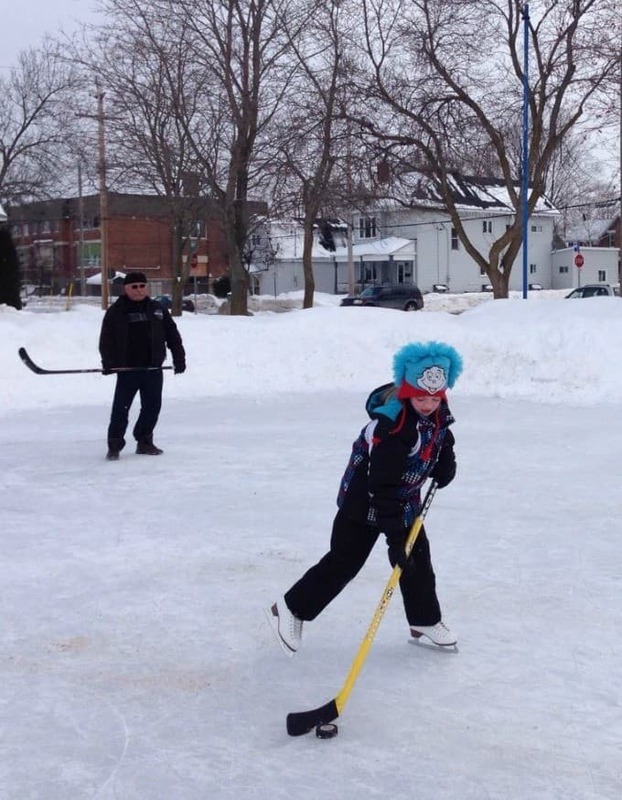 Some other fun winter outdoor activities we enjoy are skating and ice fishing. Bridget is in her second year of playing hockey and loves to show off her new skills. My dad often comes along to help her practice. He still plays hockey every week at age 62. We haven’t gone ice fishing this year yet, but are hoping to soon. One of our friends has a shack and left us an open invitation to join his family for a few hours. Maybe we’ll get lucky and catch a nice big fish! I think it’s so important for my kids today to have the opportunity to spend time together as a family in the outdoors. Though it’s easy and convenient to hide away in the house under the covers with our screens, it’s not that memorable. These fun winter activities are things they’ll remember for years to come just like I remember my family time 30+ years ago. 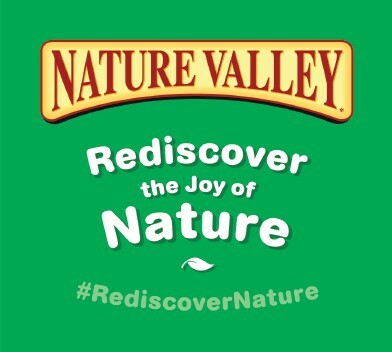 I’ve talked about Nature Valley’s Rediscover Nature campaign a few times before. They are asking Canadian families to put away the devices and go outside together and do something fun. Go tobogganing, snowmobiling, ice fishing like us. Or how about skiing or snowshoeing? Those are fun winter activities that we also enjoy. Even a simple walk around the neighbourhood or go out in the backyard and make a snow fort. There’s many ways you can make memories outdoors this time of year. I encourage you to watch Nature Valley’s mini-documentary film. They ask three generations to share their favourite childhood memories. You may be surprised by the answers and it will definitely give you something to think about. I know for me personally, it did! 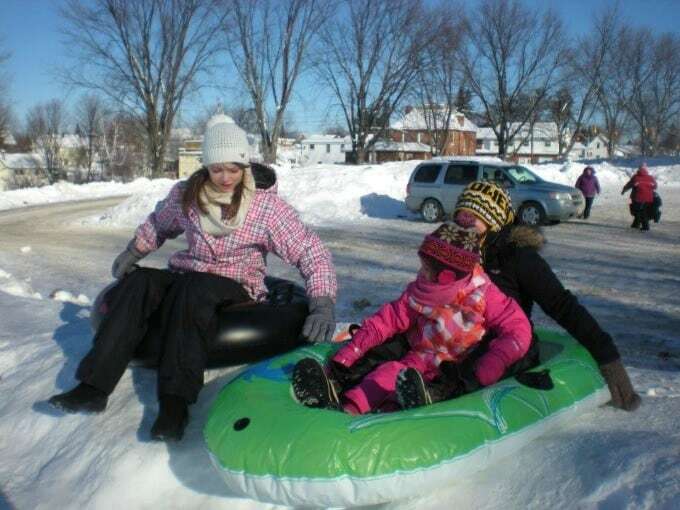 What are some of your favourite winter outdoor family activities? Isn’t it funny how our perception changes with time. I look back at the hills(?) we slid down when we were children and they look so small. Then, they were wonderful hills and we slid down them every chance we were able. My husband had a snowmobile and the children used to ride it when they were older. They also loved to skate at the local rink. They had lots of winter fun. My grandchildren learnt to ski for the first time at the weekend. My grandson (5 1/2yrs old) who has never had skis on his feet until then, sped down the hills like a pro. Mum, dad and older sister were a lot more cautious. I am such a hibernator in winter, I really don’t like winter at all. It has been pretty mild here in NH this year but still cold days have been a plenty. Love that you are able to enjoy winter with the family! It’s funny how thru the years of our child hood and or childrens sometimes pass the same way, I remember tobbaning down hills and I also remember when my kids did the same thing, My memories are one of a kind and so are theirs. What great photo’s. I so wish it snowed here in Florida, my kids have never seen snow, they would love playing in it like your daughter. Wow, good for Bridgette and even better for your dad. Yeah I agree with Nature Valley’s campaign, get out there. But I must admit, it’s easier in the warmer weather. It is so important to get outside and get fresh air. We enjoy skating on the canal here. It is great exercise. This is a great campaign Nature Valley has. What a great way to spend time in the winter snow! My husband loves to ice fish but we don’t live where the lakes freeze over so he misses that fun time fishing. I hate being out in the cold, but these are some fun activities. I took my daughters to go sledding at our local golf course over the weekend and we had so much fun! I can’t wait to do that again. I’m hoping to teach them to ice skate soon too. Sledding, tobogganing and ice skating are all big favorites of mine. OF course building snow forts and snowmen is awfully fun too! A favorite saying of mine: There’s no such thing as bad weather, only bad clothes. Just dress warmly and have fun! We just got 6 inches of snow last night, so we will definitely be having some winter fun today! That really looks like amazing fun! I live in Florida so it’s hard for me and the kids to picture such snow fun, thanks for sharing yours! My kids have been having a lot of winter fun on the couch. I need to get them outdoors to have real fun! It has not been much of a winter here in Texas so far. That looks like a lot of family fun! We haven’t gotten any now yet this winter and my son is anxiously waiting for some! I’ve wanted to try these products for a very long time. We just a big snowfall…..gonna be a fun weekend out there! My kids sure love the snow! Snowmobiling and tobogganing this weekend!